On battlefields, relics often surface decades after the battle. This is mainly because older generations kept the items as souvenirs or because local residents found practical applications for them. Here is a fascinating story revealed by the discovery of an old army bag. This bag, “Musette Bag M1936,” according to U.S. military specifications, surfaced in an old house in the vicinity of LaGleize, Belgium. The village is well known for having been the scene of hellish combat during the Battle of the Bulge. 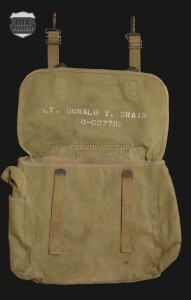 Beside an unusual rubberized texture, the musette bore the owner’s name and serial number: Lt Donald V. Swain 0-687782. 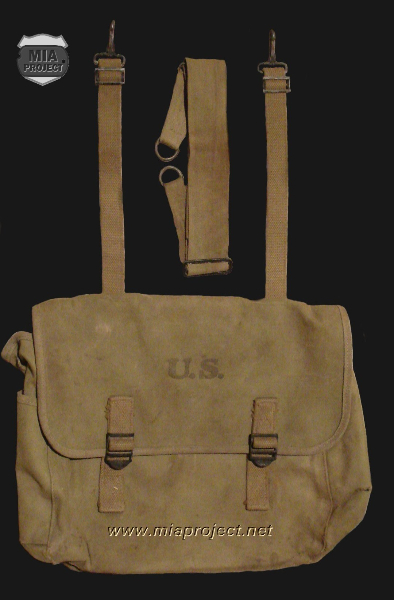 This type of bag, often carried by airborne soldiers, was thought to be from an 82nd Airborne trooper since that unit saw heavy action in the area. The MIA Project’s database revealed that Lt Swain’s name was inscribed on the Tablets of the Missing at the Ardennes American Cemetery. The date of death was puzzling – May 28, 1944, four months before the liberation of Belgium! A call to the cemetery confirmed the date and shed light on the former owner’s whereabouts. 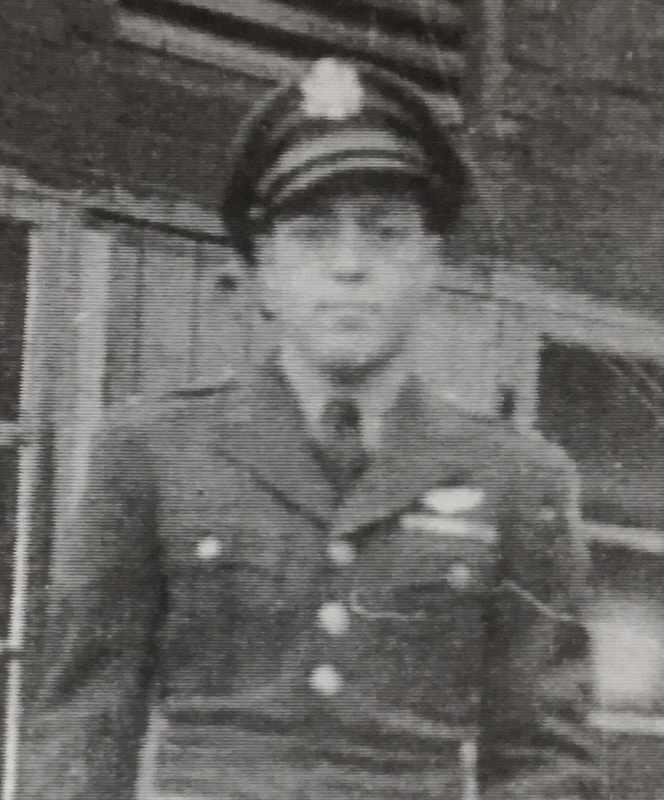 Donald V. Swain was a B-17 crew member of the 751st Bomb Squadron of the 457th Bomb Group. 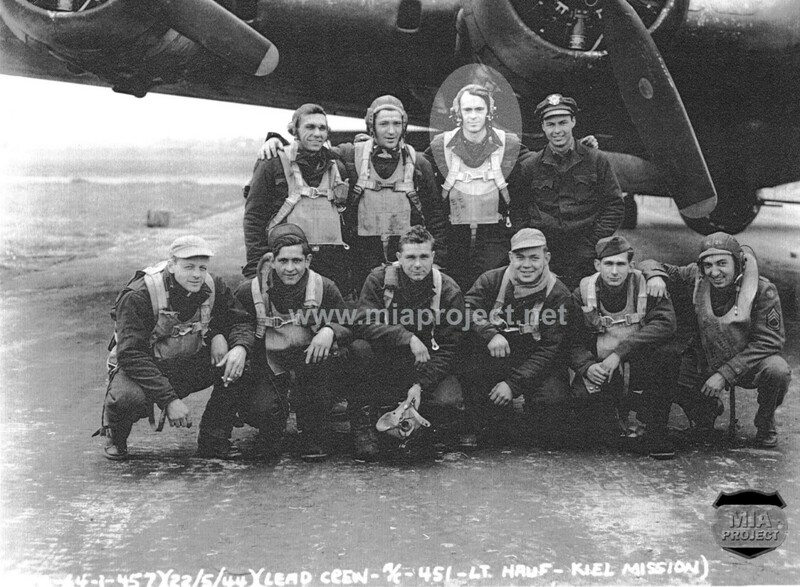 The MACR (missing air crew report) added more information. The B-17G serial 42-97452 was lost at sea with all its crew after a bombing mission over Dessau, Germany, on May 28, 1944. The information was interesting but didn’t answer two questions. What happened that fateful day and how did the bag end up in Belgium? The first aircraft arrived at Glatton on January 17, 1944, and the group flew its first combat mission on February 22. On May 28, 1944, the 457th flew mission number fifty-three. There were multiple targets, all related to the Junkers aircraft works at Dessau, Germany. The flight was uneventful until the different elements of the 457th took separate courses toward their different objectives. On the approach to Dessau, the 457th encountered a mixed force of fifty to sixty Me109s and FW190s, and several ships went down. After the bomb run, and just as the formation departed for home, the craft piloted by Lieutenant Emmanuel Hauf sustained a Flak hit which set the right wing on fire. 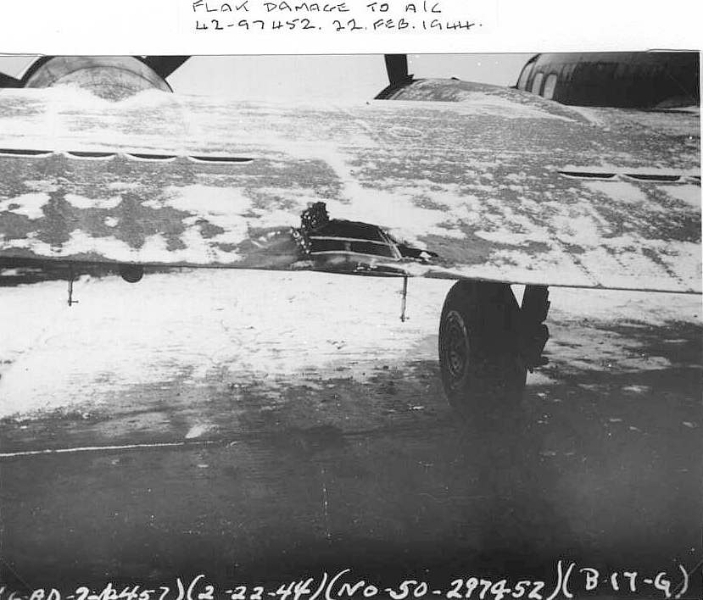 The damage to the wing was noticeable as it was on the leading edge and on the top surface, but the plane remained in formation. Over Belgium the plane began lagging behind and losing altitude. Though the circumstances under which the musette bag ended up in the LaGleize area will never be known for certain, it’s reasonable to assume that the crew of Hauf’s ship discarded excess gear to help keep their machine aloft, and the bag probably was among the items falling from the clouds. 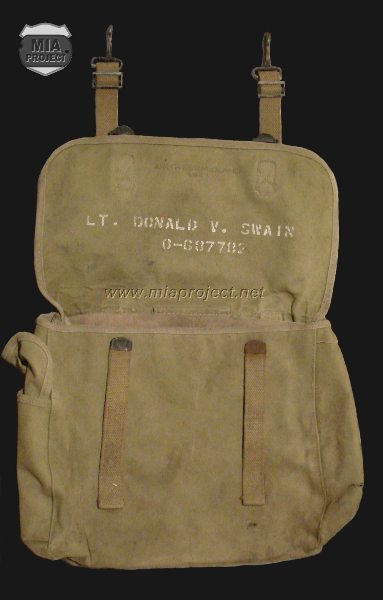 Beside Swain’s name, which sparked the research, the bag also brought back to light eight other forgotten names. The ill-fated crew remains lost at sea, never to be recovered. Their story had to be told. B-17G serial 42-97452 (no known nickname) – 751st B.S, 457th B.G. 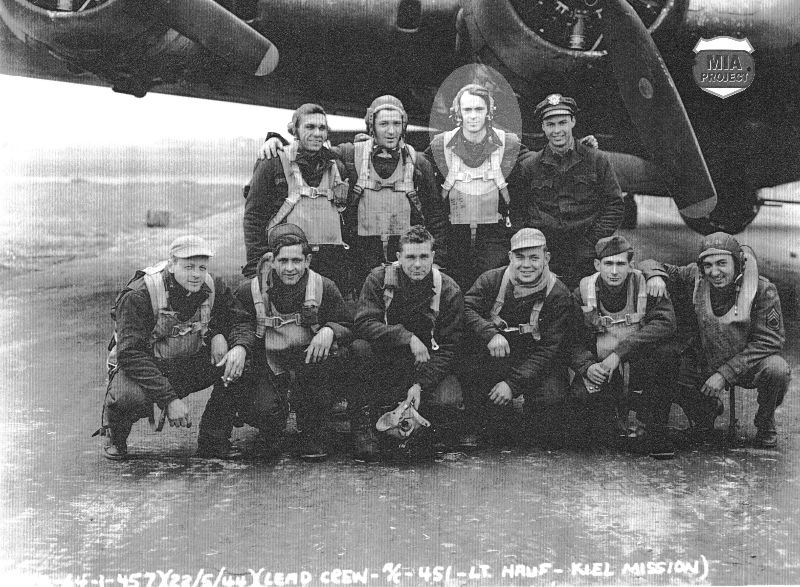 Lt Hauf’s crew pictured on May 22, 1944 after the Kiel mission. Lt Donald V. Swain is standing, third from left.